Best New Reads of 2016! 2016, man. It's been a year, am I right? Like many of you, 2016 has put me through the ringer in more ways than one. But there's also been some exceptionally good things—chief among them, the number of really fantastic books I've read. In the last year I've read a total of 87 books, 19 of which were unpublished books I read either as a critique partner or as a Pitch Wars mentor. (I've definitely never had a year with so much beta reading before! And I can't wait until those books are out in the world and I can share them with all of you.) Of the published books I tracked on Goodreads, a whopping 30 were five-star reads. I read very few books this year that I didn't totally love. Adult fiction. Totally delightful, perfectly-paced, and life-affirming women's fiction that manages to be both sweet and thought-provoking. Middle grade fiction. This is one of this year's Newbery Honors, and I just adored it. I particularly loved that while it's a masterfully done historical fiction, the focus is on the character's personal story, not the historical setting. After I got past the really difficult beginning, I loved how hopeful and lovely the story managed to be, despite being about such grim topics. Middle grade fiction. There were a lot of books that really stuck with me this year, but The Thing About Jellyfish tops that list. Gorgeously written, sweet, and sad, it beautifully tackles a very real experience for middle schoolers. I also loved how it was strongly hinted that the main character was likely on the autistic spectrum, but the focus of the story wasn't on her neurodifference, and the way the story told was very inclusive. Middle grade fiction. I was a little bit freaked out when I first saw the cover and synopsis for this book in the spring, because I'd just barely begun querying my own middle grade book about magic bees (which pretty quickly got an agent and sold to HarperCollins, hooray!). Once I read it, though, I was relieved to see it's very different than my own—and fell head over heels for Eager's lovely storytelling and the unique way that she intertwines fables and family history with her contemporary story. Middle grade fiction. No, I have no idea how I went 15 years after its publication without reading this one, but I loved it. Short, sweet, and guaranteed to bring a smile. Middle grade fiction. Stead is one of my favorite authors of this year, and of the books I read (the other being the equally fantastic Liar and Spy), Goodbye Stranger is the one that's really lingered in my mind. I love how well it tackles some really hard topics in an utterly sensitive and age-appropriate manner. Stead's sparse and straightforward writing, and her compelling and unique characters, are completely hypnotic. Middle grade fiction. This was an unexpected gem; Penney's debut novel is another that tackles tough subjects with grace and humor. Adult fiction. I'd heard mixed things about this one, and wasn't sure what to expect going in, but I ended up devouring almost the whole thing in one night and absolutely loving it. The ending was a little abrupt and unexpected, but I loved the rest of the book enough that I was able to get over that. Sweet and life-affirming. Middle grade fiction. I also read Levy's debut novel, The Misadventures of the Family Fletcher, but while that was also a five-star read, Rock Island edged it out just a bit for me. I read this the week before Christmas, and the grin-inducing storyline plus the warm, summery setting were just what my tired midwinter heart needed. Middle grade fiction. Lloyd's debut, A Snicker of Magic, was actually the first book I read in 2016, and while I also loved that one, The Key to Extraordinary was even better. I loved everything about this book—the setting, the characters, the theme, the folk music woven through it, and all the references to lavender-peach muffins, which I'm still going to try my hand at making one of these days! Middle grade fiction. This was an unexpected gem that I picked up off a library display shelf one day. It was such a unique story, and while some aspects of it were so stressful to read, the plucky, voicey narrator kept me turning pages at top speed. Courage for Beginners manages to be both funny and heartbreaking, which is a pretty winning combination in my book. Middle grade fiction. Green's verse is absolutely luminous, and her subject matter is sweet and sad, in all the best ways. It's also one of the best depictions I've read of a side character with cystic fibrosis! Adult nonfiction. Let me level with you here. I didn't really expect to love Love Warrior nearly as much as I did. I definitely didn't expect to find it profoundly moving, the kind of book I wanted to buy and reread the second I'd closed the cover. The Momastery blog can be slightly hit-or-miss for me, and while I appreciate a lot of Glennon's insights, I figured this book couldn't live up to the hype. But for me, at least, it totally did. In addition to being an honest and unflinching memoir that avoids stepping too far into navel-gazing or coy I'm-a-disaster-but-I'm-so-cute territory, Love Warrior is also packed with incredibly thought-provoking musings on society's expectations for women and for relationships. Young adult fiction. McLemore's debut is gorgeously written, evocative, and unique; I can't describe it in words that really do it justice. The magical realism is light and perfect, and the story is so rich with atmosphere you could cut it with a knife. One night last year, I sat in our blisteringly hot non-air-conditioned apartment during the hottest summer ever recorded in Portland's history, utterly miserable. I'd started the summer off with the most exciting period in my writing life—after a year and a half of querying agents, the second book I'd queried had gotten a bunch of glowing agent requests right out of the gate. This is it, I thought, the idea thrilling through my veins like gold. This is how it starts. This novel is going places. But then, only a few months later, every one of those full requests had come back as a rejection, one after another after another. And on that hot, miserable day, I'd gotten two rejections back-to-back, from the two agents for whom I had the highest hopes. I sat on the couch that night, hooked up to my breathing treatments, staring at my computer, unable to muster the emotional energy even to scroll through Facebook. I felt mired in black fog, filled with an unhappiness that ran bone-deep. I couldn't bring myself to write. I couldn't bring myself to catch up on e-mail, or to read a good book, or any of the other things with which I usually occupy my treatment time. I knew, somewhere deep in that depressed fog, that what I most needed was a hint of Godly reassurance, a small bit of direction: Go on, or give up? And yet I knew, also, that I was way too dispirited to try to muddle through the lovely but complex words of a Bible passage. I opened a browser and said a prayer that was a little stubborn, a little brazen. Lord, please help me to find the message that You have for me tonight, and please let it be on the main page of LDS.Org (*the website for my church, which often has inspiring messages & videos on its main page) because I don't have the mental energy to hunt tonight. I stared at it, not sure whether I felt more like laughing or crying at this further evidence of my long-held belief that God, up there in his high heaven, has a pronounced sense of humor. I read the article and then closed the computer. It wasn't the message that I had wanted, exactly, but it was restorative, nonetheless. The next nine months of my writing life were, in many ways, soul-crushingly difficult. That book went on to make it into Pitch Wars, get a dramatic overhaul, pull in more agent requests, and then, over the next several months, rack up yet more rejections. By February, I knew that I'd reached the end of the road for that manuscript; I'd queried over a hundred agents, finally gotten feedback from a few of them that showed that my book would really never have a chance in its market without another substantial rewrite, and exhausted the list of agents I'd be interested in working with. It was a dark, dark moment: I had another manuscript that was nearly ready to go out, and I and my critique partners all felt like it had great potential, but I couldn't shake the feeling that my efforts really were all going to be doomed, regardless. I will be doing this over and over again for the rest of my life, I thought. Is it really worth continuing? I reflected often on the tongue-in-cheek you might be glad the Lord made you wait message from the previous summer. When, I thought, would I finally get to the "glad" part, instead of just the endless "waiting?" After much agonizing and soul-searching through February, I finally decided not to give up writing, for one simple reason—I'd given up before, and I'd learned that even if I put my fiction aside for years at a time, I'd always eventually come back to it. It seemed best to just plod ahead and avoid wasting my own time, if I knew that would be the case again. With fingers crossed, I finished revising the book I was working on—a middle grade novel called WHERE THE WATERMELONS GROW—and started querying it, including entering it into a brand-new Twitter contest called #DVPit, for marginalized writers with diverse stories. (I am disabled/chronically ill, and WATERMELONS is about schizophrenia.) Within four days of #DVPit, I had my first agent offer, and over the next 10 days I had a dizzying string of further offers. You might be glad, I thought as I deliberated and finally accepted one of the offers. You might be glad. A few weeks later, after a round of revisions with my new agent, we sent my book out on submission. And within two or three weeks, we had our first offer. 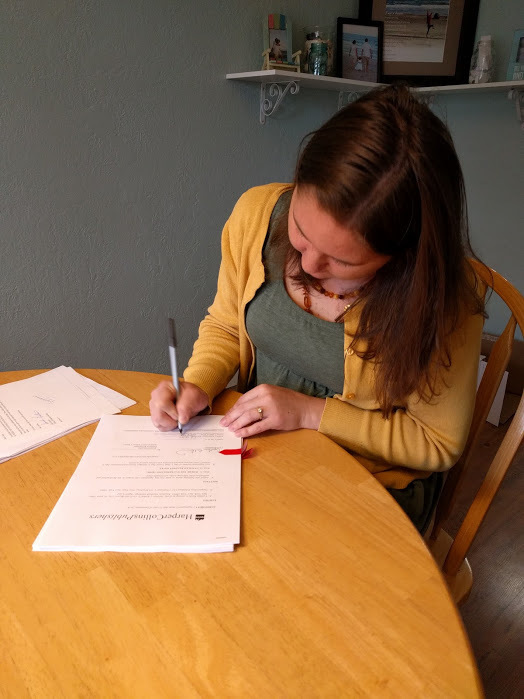 By about the one-month mark, I'd accepted an offer from HarperCollins Children's publishing, for a two-book deal from an editor who gushed about my book in a way that felt utterly surreal. And suddenly, in that whirlwind summer week exactly a year after the miserable night where I begged for a message from God, I felt it. The gladness. The joy. The gratitude. My previous book, I knew somewhere deep in my gut, would not have done nearly so well, and would not have been as strong a debut novel, even if it had been picked up (which was highly unlikely). And suddenly, I was deeply, utterly grateful for the road I'd been traveling for the past few years, and the place it had brought me. You might be glad the Lord made you wait. And oh, my friends. I really, truly am. Long ago, in a land far far away, my now-husband and I were young college students flirting with the idea of taking our casual friendship a step further. It was October, and he invited me to his parents' house one weekend just before Halloween. "I bet I can carve a better pumpkin than you," he boasted, in the true spirit of our very competitive flirtation. I'm going to warn you, folks: This year was, um, not our best year. We tried some new things, including a dremel (long story, but we're not big fans, actually! ), and neither of our pumpkins quite lived up to our visions for them. They definitely don't hold a candle—pun intended—to some of our truly great years. And this year, I think we're both starting to feel the potential for a change in the breeze, the inkling of a time when this pumpkin carving contest will have run its natural course, as it were, and be consigned to past tradition instead of present. But for this year? It's still on, baby. And this year's theme is Harry Potter! 1. Just ONE vote per person... no cheating! If you don't have a Google or OpenID account and so you're voting anonymously, make sure to sign your vote. Unsigned anonymous votes may be deleted. 3. Get all your friends and family to cast their votes too! Share on social media! Bug your co-workers! And now, for the pumpkins. This year's Pumpkin A is a spooktastic take on one of cinema's most horrible (and marvelously Halloween-ish) scenes, as far as I'm concerned: Harry's and Ron's run-in in the Forbidden Forest with Aragog, the massive and horrible Acromantula and former pet of Hagrid's, who might bear Hagrid himself love but holds no compunction about eating Hagrid's friends. Carver A truly broke the bounds of pumpkin carving this year, creatively using two pumpkins to create a 3D masterpiece. The jagged skyline recalls the trees of the Forbidden Forest that hem Harry and Ron in as they prepare to do battle with Aragog, and Carver A even used specialized tools to suggest the branches of the trees above them (visible in the daylight pictures). Harry and Ron stand back to back, wands raised and aglow, as Aragog crashes toward them. Especially noteworthy in this year's Pumpkin A is the expert level of detail on Aragog: minute pincers that grasp for the beleaguered boys as they try to make their escape, the texture along his back suggesting bristly hairs. What it lacks in traditional pumpkin glow, this work makes up for with innovation and emotion; without doubt, this year's Pumpkin A is a unique masterpiece. This year's Pumpkin B, not to be outdone, takes a different tack: this expertly-rendered and traditionally carved tableau depicts Harry's climactic battle with Salazar Slytherin's pet basilisk, deep within the Chamber of Secrets. Using simple-looking but fiendishly difficult outlining techniques to dramatic effect, Carver B has shown us Harry in his final, heart-stopping moment, as the basilisk rears above him to take deadly aim and deliver the killing stroke. Gryffindor's Sword glows with purpose as Fawkes the Phoenix swoops down from the top right corner, and Harry, nearly defeated by still undaunted, prepares for his last stand. Especially of note in this year's Pumpkin B is the lifelike reality of the basilisk, complete with minute fangs, ready to pierce Harry's upraised arm and very nearly turn the Wizarding World over to Voldemort once and for all. All right—it's time to head to the polls! Voting will remain open until Wednesday, November 2nd, at around 8pm Pacific time. Today I have the incredible privilege of sharing a chat with Shari Green, author of the debut middle grade novel-in-verse ROOT BEER CANDY AND OTHER MIRACLES. Thanks to an Amazon goof, I had the chance to read this a little bit early, and it was so good. Definitely one of my favorite reads of 2016! The verse is light and lovely, the setting is perfect, and the plot deals with major issues in a sensitive, gentle, and ultimately hopeful way. If you're a fan of Sharon Creech, you should definitely give ROOT BEER CANDY a try! The locals in Felicity Bay shake their heads at the ice cream man’s prophecy. “Crazy old Jasper,” they say. But Bailey isn’t so sure. She’s found something special down at the beach: a driftwood mermaid, a gift washed up from a storm. Could she be the stranger from the sea who has come to change everything? Bailey hopes so. Because this summer, she could sure use a miracle. Where did you get the inspiration for ROOT BEER CANDY AND OTHER MIRACLES? I’d been thinking a lot about the extraordinary in the ordinary—Frederick Buechner said “all moments are key moments, and life itself is grace”, and that quote had been tumbling around in my thoughts. Meanwhile, I knew I wanted to write a “beachy book” someday—something in which I could really indulge my love of the sea. And then a driftwood mermaid showed up in my imagination, and the pieces started coming together. I'm a big fan of verse novels in general, and especially for a middle grade audience—somehow they seem to work so well with the struggles of that age group. What made you decide to write ROOT BEER CANDY in verse? Is this your first verse novel? Yes, it’s my first verse novel…but it didn’t start out in verse. At first, I struggled to find Bailey’s voice—after a few false starts I finally tried it in verse, and there was Bailey! As I wrote, I realized other reasons to keep going in verse: I felt complete freedom to use imagery to weave the setting throughout the story, and the format allowed me to use white space to give readers room to ponder ambiguities and unanswered (unanswerable?) questions. Above all, verse just felt right for me and for Bailey’s story. One of the things that really drew me to ROOT BEER CANDY was the inclusion of a side character who has cystic fibrosis, like I do. CF isn't something that comes up a lot in fiction; what made you want to write a character with CF? I’m not really sure why Daniel appeared in my imagination the way he did. I haven’t met many people with CF. And yet, there was Daniel with his chest physio and his eleven-year-old version of a seize the day attitude, and I loved him. It meant I had a lot of research to do, though! I knew I wanted him to have an important role in the story, because, like all kids, children with chronic illness need to see themselves in books. They need characters they can connect with, that maybe help them feel not so alone in what they’re dealing with. I hoped Daniel might be that character for a child somewhere, someday. I also appreciated how authentically and sensitively you handled the issue of Daniel's life expectancy as a result of his CF, something that is definitely the elephant in the room for most of us. I love that it's not a focus of the story, and that Daniel is allowed to be a regular kid, but that it's clear that it's something Daniel thinks about. What made you want to include this, specifically, in Daniel's storyline? I think one thing I love about a lot of children’s literature is that it doesn’t shy away from the tough stuff. So often kids are impacted by the hard truths of life, but adults whisper, censor, try to ignore those realities. This comes from a good heart, I think—from wanting to protect kids. But kids are smart and so very observant. They’re aware of the tough stuff, and they’re developing compassion for others and coping skills for themselves as they deal with it. Including the bit about Daniel’s life expectancy was a way of validating his experience, a way of saying your reality matters, your worries matter, the tough stuff you think about matters. In your dayjob you work as a nurse (right? )—do you feel like that background helped you in writing authentically about CF and childhood illness? Yes, I’m an LPN. My background probably helped somewhat by allowing me to be comfortable tackling the subject of chronic illness (and maybe especially the life-and-death aspect). However, most of my experience as a nurse has been on the surgical ward—not at all the place for childhood illness! Ultimately, I had to rely on research. Since the beach is my #1 happy place (mine is the Outer Banks! ), I love the setting for ROOT BEER CANDY. I know that you live near the coast and visit often. Is Felicity Bay based on a real beach town you love, or is it straight from your imagination? Felicity Bay is completely fictional, but the island—Arbutus Island—was inspired by a real place: Gabriola Island, which is between Vancouver Island and the mainland of British Columbia. I spent childhood summer holidays there, and have wonderful memories and a serious case of nostalgia. I love the thoughtful but not heavy-handed exploration of religion and faith in ROOT BEER CANDY; I think you hit a perfect note and have a story that really will appeal to children of all (or no) faith traditions. What made you decide to include faith as such an integral part of the storyline? I wanted to include faith partly because it felt like the most honest way for me to tell this particular story, and partly because it isn’t often addressed in books. Kids think about this stuff, just as adults do, so let’s talk about it! To get more personal for a moment, I’ll add that including a spiritual element was also very true to who I am—and maybe who we all are. Don’t we all hope for miracles sometimes? Don’t we long for things that help us keep hoping, keep believing that we’ll be okay, that life will turn out all right? For me, ROOT BEER CANDY AND OTHER MIRACLES felt like the right place to explore these ideas. Check out ROOT BEER CANDY AND OTHER MIRACLES on Amazon here! Every time I get ready to dive back into a draft of a book a round of edits after feedback, I feel slightly paralyzed. Maybe you've forgotten how to do this, an insidious little voice whispers inside me. Maybe you're not up to the challenge. Maybe you just wrote a bad book, and you're not good enough to fix it. It feels a little bit like sitting at the top of a roller coaster: You know that once it gets going, it'll be fun. You know that you won't regret buying your ticket, and you know that when you get off you'll feel charged with adrenaline. And, in the case of a book, you know that you'll emerge with a stronger and more vibrant manuscript, a book more closely aligned with your vision for that story. You know that rewriting is the heart of writing and that you've successfully edited books in the past, taking them from crappy first drafts to solid—maybe even moving—final ones. But still, right up there at the top of the coaster? It's kind of a stomach-flipping, scary, actually-I-don't-want-this-ride-to-start place to be. Since I'm currently stuck at the top of this roller coaster—I've gotten some initial CP feedback back on my latest manuscript, and while I'm excited about diving back in and making it stronger, I'm having a hard time shaking off that naysaying little voice trying to convince me I don't have a prayer—I've been thinking a lot about this the last few days. The epiphany I landed on tonight was this: Really, all of this boils down to one issue. A fixed mindset vs. a growth mindset. These two terms have become pretty commonplace in the last decade, so I won't define them at length, but suffice to say they're exactly like they sound—seeing skills as things that are either innate (fixed) and stop at a certain threshold, or as things that are flexible and can be learned (growth). Research has shown that not only are people who have a growth mindset better at learning skills and adapting to new situations, they're also happier and more likely to take on challenges with excitement instead of being paralyzed by fear of failure. 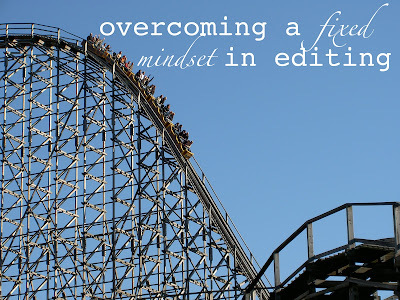 If you're old enough to be reading this blog, it's very likely that you, like me, grew up in a fixed-mindset culture. We praise prodigiousness and overnight sensations (ignoring the fact that prodigies are really just kids who manage to put in the roughly ten thousand hours required to become an expert in something very young, and that nearly all overnight sensations only become so after a years- or decades-long slog behind the scenes) and make a big deal out of things that come easily. We reward and sensationalize "natural talent" and focus much less on hard work and effort, to the point that many of us have the innate and often unrecognized feeling that if something doesn't come quickly to us, we'll never attain mastery. What I realized tonight is that each time I get ready to plunge into a round of edits, that fixed-mindset upbringing is what's responsible for that little voice whispering in my ear, the conviction that maybe I just wrote a bad book and I'm not good enough to fix it. Fixed-mindset culture assures me that this is true—that I don't have the skills to take my book from crappy first draft to polished finished draft, and that I'll never be able to learn them. My own fixed mindset keeps me mired in fear, unable and unwilling to step into the revision trenches and do the work that needs to be done. In essence, every time I hit this point, I find myself needing to pep talk my way back into a growth mindset. I remind myself that I've revised successfully before, and that I can do it again. I remind myself of how many finished manuscripts I've got behind me now. I tell myself that it's okay if I don't get it right the first time, because it always takes multiple rounds of revision before things are as strong as they can be. —I'm always learning. Just because something seems like a daunting fix doesn't mean I won't be able to adapt and learn the skill I need to fix it. —Challenges are fun! As much as part of me would love to be able to write perfect books with minimal effort, I also know from experience that diving in to a challenging round of edits and then seeing how much stronger the book has become is a thrilling experience. —I can take as long as I need. —It doesn't have to be (and never will be) perfect; it just needs to be strong, dynamic, and hitting the right emotional notes. —I'm surrounded by friends and critique partners who can help me identify my book's weak spots and give me a pep talk when I'm feeling down. —It's okay to be scared. As I'm constantly telling my three-year-old, being brave means doing hard things even when you're scared. 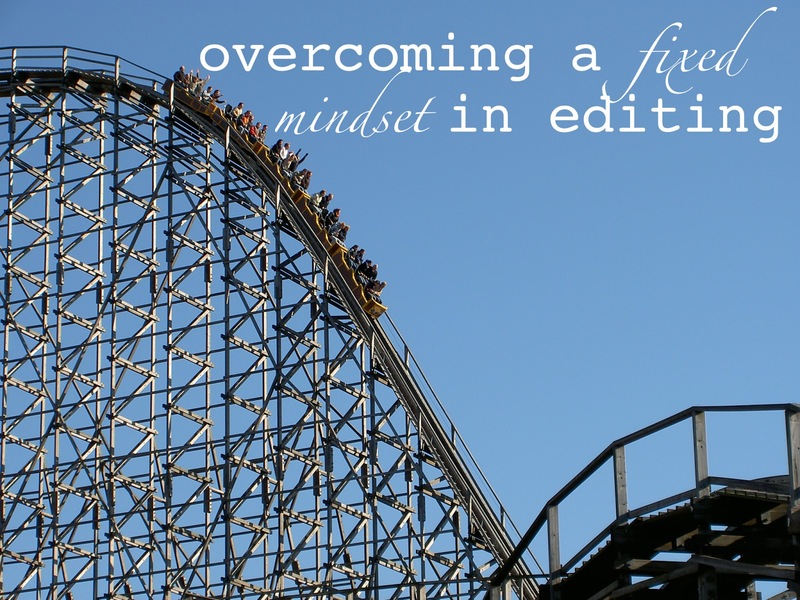 What are some of the ways you overcome a fixed mindset when you're writing or revising? 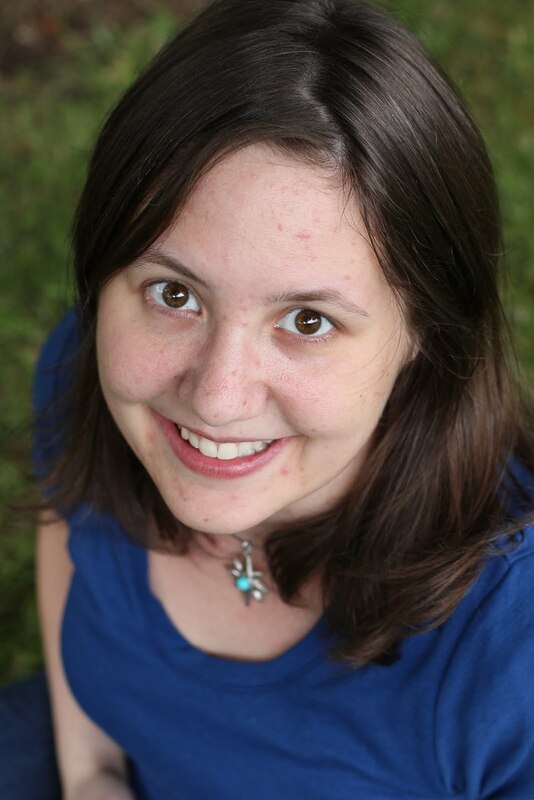 Here we are, writers, in our final post in this descriptive writing 101 series! And I've saved one of the most important—but also, in many ways, the easiest—techniques for last. We all of us experience life through our senses, and some senses in particular have the particular power to evoke memories and emotions—both in real life and as we read. Few things can ground a reader more deeply in a character's POV, and in a setting, than the author's use of well-rounded sensory details, especially if those details are combined with some of the other techniques we've discussed, like metaphor and relationship-based description. As writers, it's easy to fall back to using only one or two senses; often, we rely heavily on sight as we're describing what a reader should see in his mind's eye. One of the things that I like to do as I'm revising is keep an eye out for how often I'm bringing in descriptors that call on all five senses. Not every scene will need to have all of the senses invoked, but being mindful as I revise of how often I'm using them is very helpful. My father gives me the reins so that he can saddle the war horse with a red cloth. I lick my teeth—they taste like salt—and watch my father tie the matching armband around his upper arm. Every year I have watched him, and every year he has tied it with a steady hand, but not this year. His fingers are clumsy, and I know he is afraid of the red stallion. I have ridden him, this capall. On his back, the wind beating me, the ground jarring me, the sea spraying our legs, we never tire. In these two paragraphs, Stiefvater has given us so much sensory detail: The color of the cloth and the armband, the salty taste on Sean's teeth, the clumsiness as Sean's father ties the armband, the physical sensations as Sean remembers riding the stallion (wind, jarring ground, sea spray, the energy implied in "we never tire"). Right there, we have three different senses involved, each one of them pulling us deeper into the scene and helping us to feel it, the way the very best writing does. It's also helpful to me to think about what kinds of sensory experiences I have in my own life: What times and places do I tend to notice scents? What about sounds? Colors? Textures? Sensations in or outside of my body? What emotions tend to be associated with different senses? (Scent, for example, is tied in pretty heavily with memory and nostalgia for me.) As I think about these questions, it helps me to hone in on which senses are going to be the most evocative in any given scene. If she could eat the cold air, she would. She thought cold snaps were like cookies, like gingersnaps. In her mind they were made with white chocolate chunks and had a cool, brittle vanilla frosting. They melted like snow in her mouth, turning creamy and warm. This is an excellent example of sensory detail being combined with other descriptive techniques (in this case, metaphor) to produce a paragraph that is as delectable as it is immersive! Your assignment for today's post, if you choose to accept it, is simple: Write a brief scene, trying to incorporate all five senses. And this, my friends, brings us to the end of our series on descriptive writing! I hope that these posts have been helpful and given you some ideas for new things to try to bring your descriptive writing to the next level. As a little postscript, I will add one thing that I didn't write a post on because there's not a ton to say about it, but which is also important in good description: I know I began this series ragging on adjectives, but they're (obviously) still an important fundamental when it comes to descriptive writing. However, not all adjectives are created equal. As with other descriptive techniques, adjectives are stronger the more unique and specific they are. Just like picking metaphors, it's a good rule of thumb to use in selecting the right adjective for your descriptions is that the first idea is almost never the best one. Let things percolate. Use a thesaurus. Try writing the scene from a different angle and see what you come up with. And most of all? Have fun! Did you miss the earlier posts in the Descriptive Writing 101 Series? Check them out here!